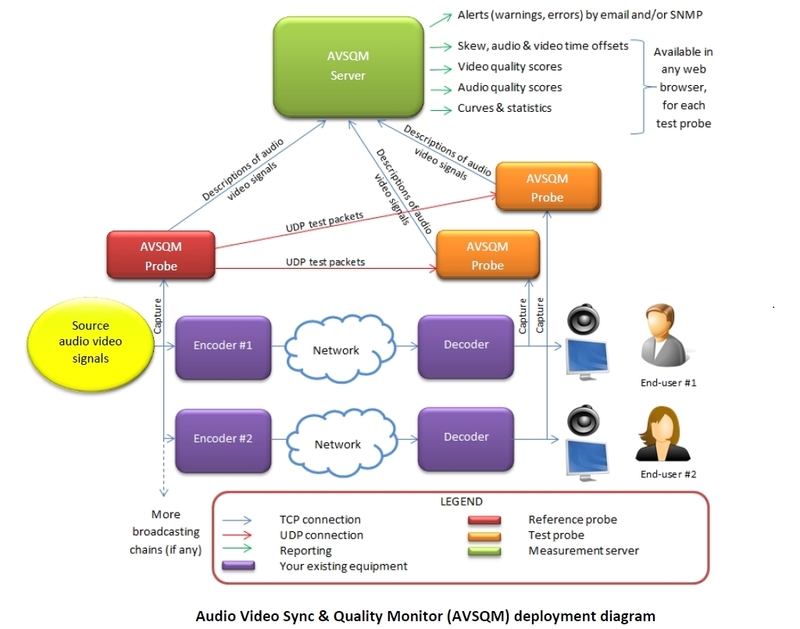 Audio Video Sync & Quality Monitor (AVSQM) is a powerful and scalable solution which enables to measure and monitor both QoE (Quality of Experience) and QoS (Quality of Service) for audio/video transmissions, especially for TV channels broadcasting. Transmission-related parameters: packets delay, jitter, reordering, corruption, etc. Machine-related parameters: CPU usage, RAM usage, etc. In parallel, probes measure the health parameters of their local machine (CPU usage, RAM usage, etc.). Probes can also exchange test packets between them in order to measure transmission-related QoS parameters (packets loss, packets delay, jitter, reordering, corruption). 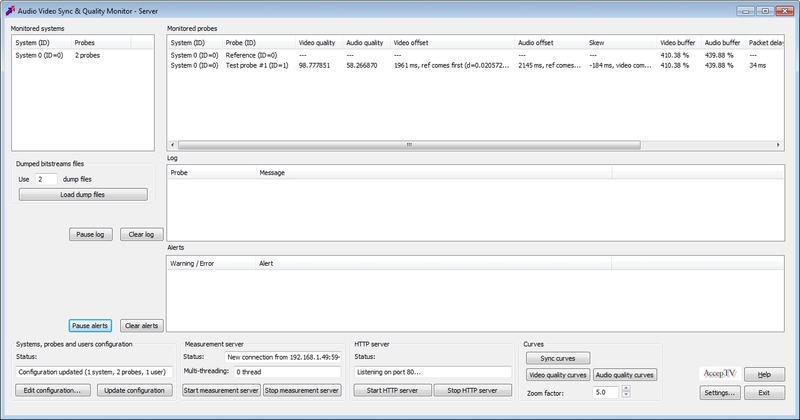 select the source settings (if needed): video camera resolution, particular stream, audio sampling rate, etc. Then the probe will process audio and video signals, transform them into short descriptions and send these descriptions to the measurement server (with automatic reconnection if the connection gets lost). All along these steps, the rich interface of AVSQM indicates the detected parameters: detected devices, detected settings, detected resolution, detected audio sampling rate, etc. It also displays the levels of the internal buffers and a log window concerning the connection with the measurement server. 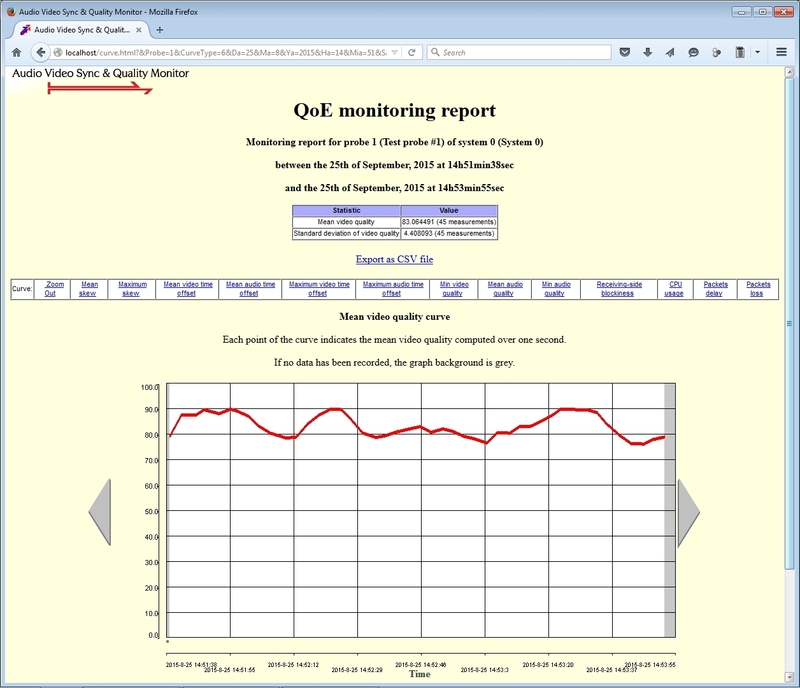 The measurement server can also trigger alerts when problems happen (when a QoE or QoS parameter goes beyond user-defined limits for a user-defined duration). AVSQM is scalable. Indeed, it supports from 1 to 1000 probes (for more: contact us). And AVSQM supports from 1 to 1000 users (for more: contact us), each user being able to define thresholds and durations to trigger alerts (two levels of alerts: warnings and errors). 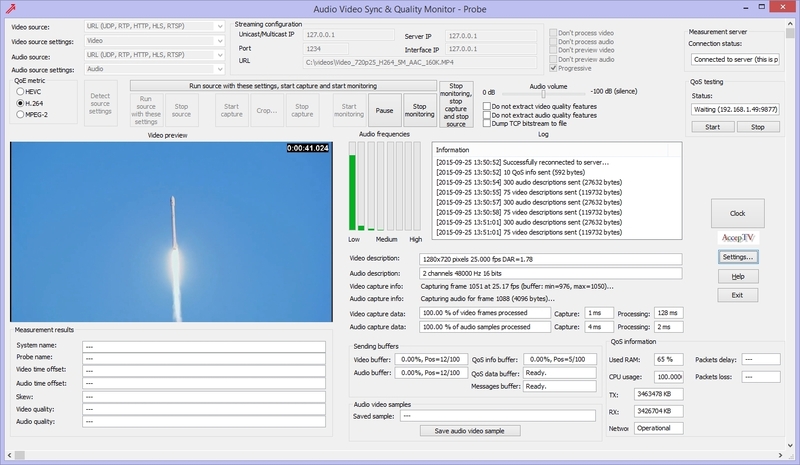 Audio Video Sync & Quality Monitor is a powerful and flexible tool to measure and monitor both QoE and QoS for audio/video transmissions. Thanks to the various types of inputs it supports and thanks to its modular architecture based on different types of probes and servers, AVSQM can be easily adapted to your audio/video infrastructure. 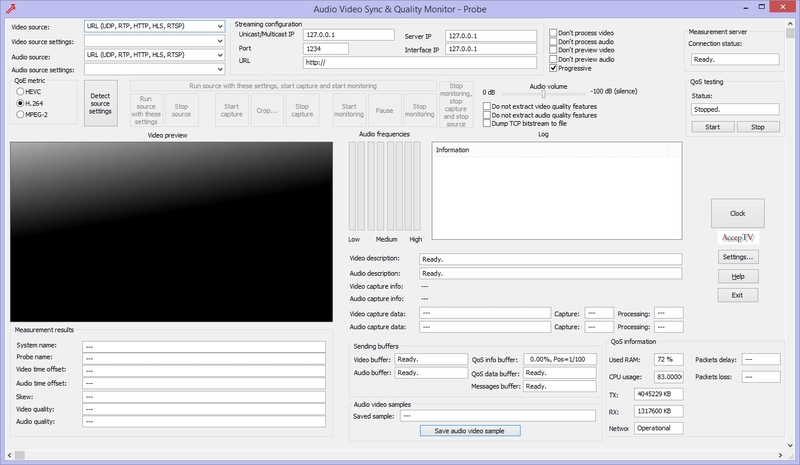 ...just ask for an evaluation version of Audio Video Sync & Quality Monitor now!